A question that has come up a few times about some of our robots is, “Does this have any educational use, or is it just a toy?” I’d like to always say that it’s educational, and emphasize how kids learn through exploration and play. But I do see the other side, especially when it comes to Sphero. Sphero can be used as the amazing round robot it is with apps like Draw ‘N Drive and MacroLab, or it can be played with as an RC toy. When I’m showing kids Sphero for the first time, I start with the basic navigation to get them used to controlling it, and it’s all too easy to stop there and just roll it around the room. From the moment I tried out the Tickle App, I was excited by how it taps into Sphero’s potential. 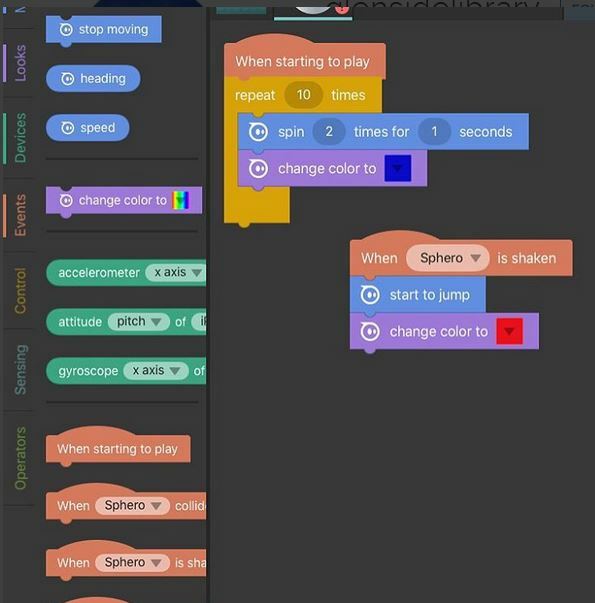 It has a visual interface that resembles Scratch, which many kids in my community are familiar with from school, the library’s coding club, or their own pursuits. It’s easy to get started — just drag and drop commands into place. It was so much fun I may have been a bit of a menace at first because of how fun the commands are — “Just pick it up and shake it. See what happens! What what it does when I drive it into the wall!” We’ve been pretty enthusiastic about Sphero ever since we got our hands on them, and the fact that after all this time we can discover a new app to control the basic hardware just reinforces that this is a good robot to have around.